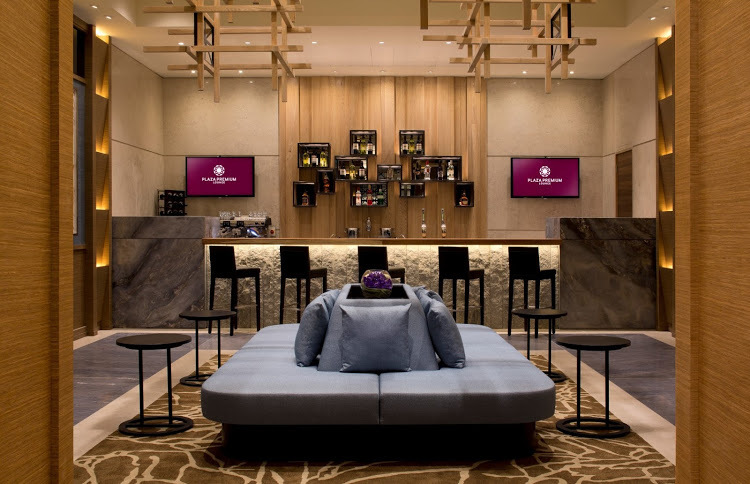 If you’re a frequent traveller, whether an habitué of business class or as a frequent flyer who ends up — like most of us — in economy most of the time, you’ll be familiar with one of the problems of a lot of airline lounges: they can be windowless boxes where nobody seems to have given any thought to lighting. It’s not just aviation geeks who like a great big window to look out of. Just look at any proper terminal picture window for people taking snapshots of their airplane, or for the grubby fingerprints and nose-marks of people of varying heights pressed up against the glass. There’s something restful and fishbowl-like about watching the big metal birds roll slowly around the tarmac, surrounded by the pilotfish of vehicles on the ramp, apron and runway. The very possibility of getting some natural light is itself important, especially in these days of network carriers, longer flights and new points to make your connections. That’s why airlines themselves, as part of the well-being information provided in their magazines, inflight entertainment systems, social channels and even onboard announcements, recommend using daylight to help adjust to jetlag. It’s also why Qantas, in its new Perth lounge, has an outdoor open-air barbecue area even though there’s no actual view from it. You don’t get any of that if the lounge has no windows. Now, some airports are worse at offering interior-only spaces than others, with internal rooms lit by dim last-generation energy-efficient bulbs that lack an ability to shift from a cooler, bluer daylight to a warmer yellow light at sunset, like our electronic devices do to help our diurnal rhythms. Third party lounges in many airports are notorious for the windowless box problem, and it doesn’t help that these spaces are often furnished straight out of a cut-price corporate furniture catalogue with little reference to a coherent whole. I recall one lounge in Toulouse with bright pink chairs that stood out like a sore thumb in the starkness of the fluorescent lighting. But it doesn’t have to be that way. An increasing number of lounges are being built either on top of existing buildings or as part of new terminals. Where a new build isn’t an option, thoughtful use of lighting is crucial to create a cosy, Hobbit-hole like space to curl up like a nest. The Plaza Premium lounge in Heathrow’s Terminal 2 feels like this, although it is a little bit on the dark side even there. 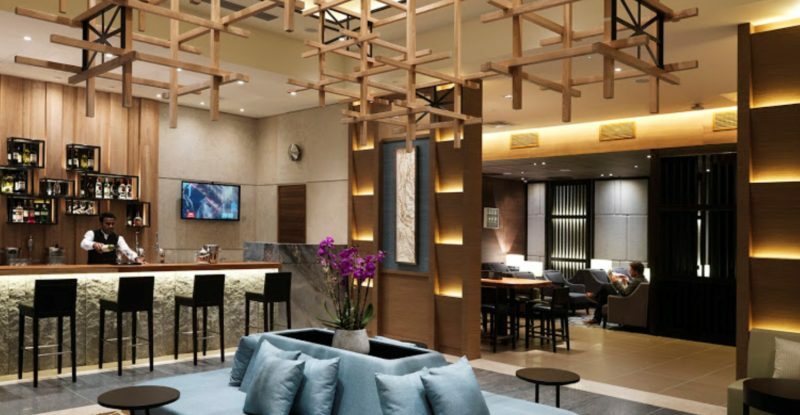 Few lounges take advantage of the smart lighting trend in home interiors, which permits varying the warmth and strength of the lighting according to the time of day either. If Ikea has an app for that, there’s really little excuse for airline lounges not to have got into the game — whether Internet of Things-enabled or not. But there’s another option: if actual reality doesn’t give you the view you want, add a skylight — or Skylights. 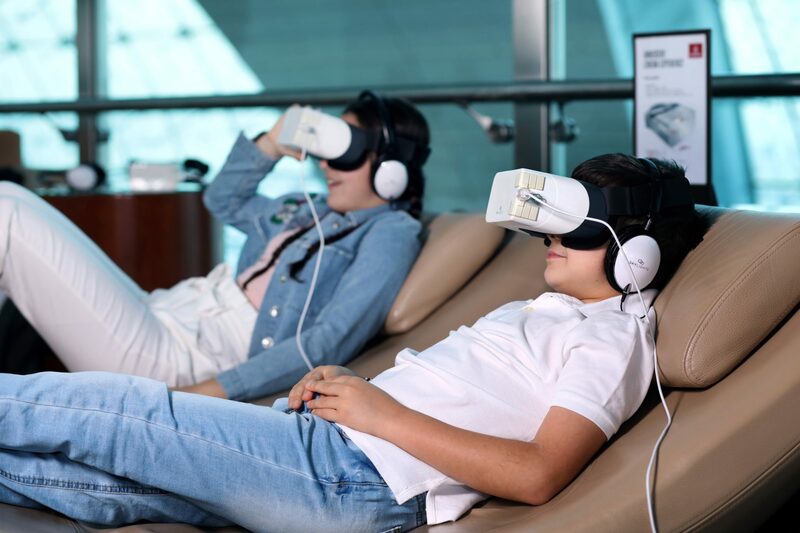 Both Etihad and Emirates are trialling 2D and 3D content on Skylights’ VR headsets in their home lounges in the UAE, with Etihad specifically mentioning the latest-generation Allosky model while Emirates’ PR snaps show what looks to be an earlier version. The end goal for the Skylights product, as CEO David Dicko emphasised to me last month at the Aircraft Interiors Expo while trying out the latest headset, is to get on the plane, and reading between the lines these airlines may well be using the lounge experience as a trial for more than just on-the-ground PaxEx. Is this the killer airline application that VR has been looking for for so many years? It may well be. But in the meantime, there’s a here-and-now solution for those windowless lounge boxes. And that’s a big plus in my book.